Tagline: It can carry 50 times its own weight ... IN DEATH! A small, isolated community is located near a nuclear power plant. Unbeknownst to the populace, a radiation leak is polluting their food, and fire ants that are eating that food from picnics are starting to mutate. 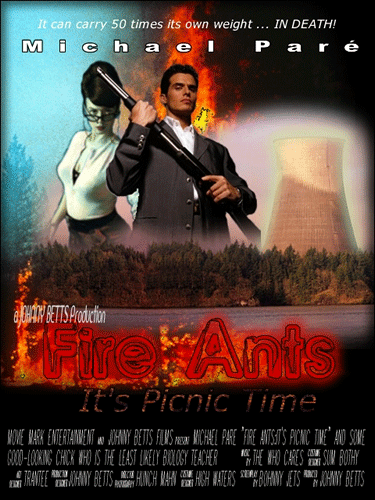 Once residents start to notice human-sized ants walking around, they seek help from the sheriff (Michael Paré) and a local biology teacher (any good-looking female with minimal acting experience who is willing to work for the least amount of money). Unable to offer an explanation as to why the radiation isn’t affecting humans, animals, or other insects, it’s decided that they at least need to find an answer on how to deal with the mutated fire ants. Coming soon to the back shelf of an unknown, local video rental chain near you.